Experience God. Grow in Love. Give it Away. 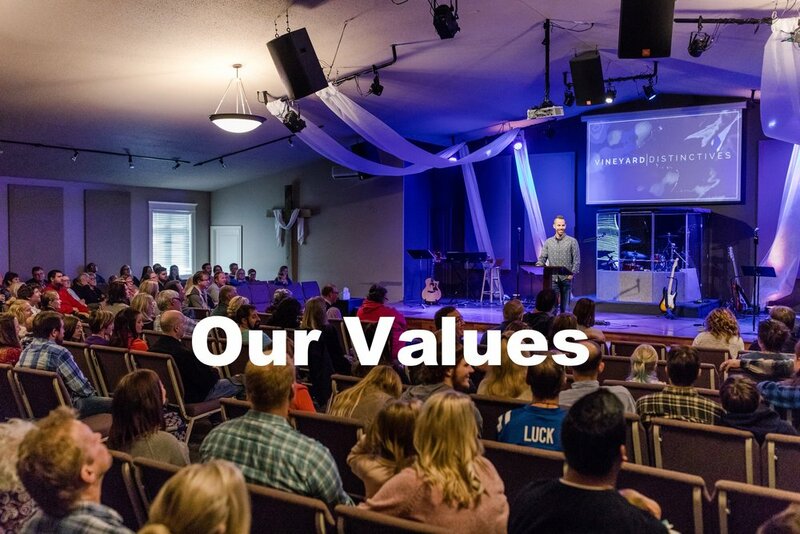 Lakes Area Vineyard Church is one church with two campuses: Detroit Lakes and Park Rapids. We're a community of people learning what it means to be disciples of Jesus Christ. No matter where you’re at or where you’ve been, there’s a place for you here. WHAT TO EXPECT: Complimentary coffee and treats in the lobby. Separate Vineyard Kids services available for ages 0-12. 25ish minutes of engaging worship. A 35ish minute practical and relevant teaching from the Bible. Prayer ministry offered at the end of each service. Dress however you like! We tend to be pretty casual. For a glimpse of what Sundays look like around here, check out the video below. One of the first steps we encourage you to take is attend a Welcome Lunch. This is a fun and informal opportunity to meet our pastors and staff. You will hear more about our vision and values and enjoy a lunch provided by us! Free childcare is also provided. We host a Welcome Lunch every six weeks. You can find the next date for a lunch by either checking out our Facebook page, looking in the program on a Sunday morning, or by giving us a call. Vineyard 101 is the next step after attending the Welcome Lunch. We will cover the history, values, priorities and practices of the greater Vineyard Movement and our local church. Lunch and childcare are provided! You can find the next date for the Vineyard 101 on our Facebook page, looking in the program on a Sunday morning, or by giving us a call. Would you like to attend the Welcome Lunch or Vineyard 101? Fill out the form below and we'll reserve you a spot! We're a community committed to following Jesus together. We believe God forms us into the people He created us to be when we live in open, honest, and loving relationships. We desire to know and experience God's presence, hear His voice, and willingly take risks to follow Him. We believe the Bible is the word of God, inspired truth, trustworthy for revealing the nature and character of God, and relevant to all people. God's Kingdom is the central message in the work and ministry of Jesus. It's a future hope and a present reality, both "now and not yet." We ask for God's kingdom to come and His will to be done while waiting for the fullness of His presence and power. We're an outward-focused community committed to sharing God's love by meeting practical and spiritual needs of people both locally and globally. We encourage and equip people to courageously share the gospel, use their gifts and abilities, and walk daily in the power of the Holy Spirit. Our hope is to reflect the love God has for His people through the way we love others. Christ-centered relationships are the primary source of care and connection within the church. That's why we offer several classes, small groups and life groups throughout the year. For more information or to register for a group, click the link below. You are uniquely wired and gifted to serve in a specific way. We value creating opportunities for everyone to serve in and outside of the church walls. If this is your church home, we feel it's extremely important to serve in some capacity. Not only is serving a great way to invest into the Kingdom but it's also a great way to build relationships within the church. If you'd like to serve, fill out the form to below and we'll connect with you soon! NOT SURE WHERE YOU FIT? If you'd like some direction in discerning the gifts you've been given check out this online Spiritual Gifts Assessment created by our friends from the North Phoenix Vineyard Church, or take this printable assessment. Disciples of Jesus lay down their whole lives for Christ—and our whole life includes our finances. Giving is an important part of learning how to surrender control of our lives and it teaches us to trust the Lord with everything we have. CASH OR CHECK: You can give your contributions during one of our Sunday worship services, or by mailing a check to the address below. Please make checks payable to LAVC. CREDIT: text "GIVE" to (218) 203-8116 or fill out the form below.